David Staats practiced law for twenty years and is a member of three states' Bars. Before practicing law, he was a soldier, a student, and a C.P.A. He now writes mysteries and thrillers. He also has translated the novella of medieval intrigue, The Monk's Wedding, from the German. His website is at davidstaats.com. The Case of the Missing Department Head by David Staats has all of the great hallmarks of a cozy mystery, but carries the weight and merit of a wholly engrossing crime fiction. Walter Dure is a lawyer who also takes on the role of quasi-detective, fishing out details and discussing events with anyone and everyone who may be associated with the crime, its victim, or its accused. Staats has done an excellent job of packing a huge punch in a novel that is shorter in length. I actually really liked Mr. Houlihan, frustrating and bumbling as he was...and all of the ancillary characters were equally appealing. The writing is sublime and nothing is given away prematurely - which I am always grateful for - making this book the perfect choice for an afternoon of murder, mystery, and an intriguing whodunit. In David Staats’ debut novel, The Case of the Missing Department Head, Tiffany Houlihan, head of the county library system in Canterbury, Pennsyltucky, is found dead - minus her head - and the police immediately suspect her husband, Howard. She was, after all, a bit of a bully. It is not long before Howard is arrested and charged with his wife’s murder. He engages the services of local attorney, Walter Dure, but the lawyer is aghast when he discovers that his client from hell has ignored his legal advice, making the defense even more difficult than it had been. With the prosecutor threatening to seek the death penalty, Dure needs to use every bit of ammunition in his arsenal to overcome a key piece of testimony in the prosecution's possession and get an acquittal for his client. At times it looks as though he might be in with a chance, but chances come and go and unless Dure can pull off a miracle, his client’s life remains in jeopardy. The Case of the Missing Department Head is not a long read, but if you’re looking for something that will get you through a sleepless night, this is it. It’s a legal thriller in the vein of Grisham, the difficult-to-put-down variety. The writing is crisp and clear, intelligent, and I suspect is written by a lawyer intimate with the inside of a court room. The scenes are so well described it is easy to follow the action, movie-like, as it unfolds. For those not used to legal terminology, language and procedure, David Staats has used the clever device of having, at least for a time, a blogger sitting in the back of the court room, typing and uploading an explanatory observation on what is going on. What this character types is reproduced in the narrative. When we get to the trial itself, it is difficult to put the book down not knowing how — or if — Dure can achieve the seemingly impossible. 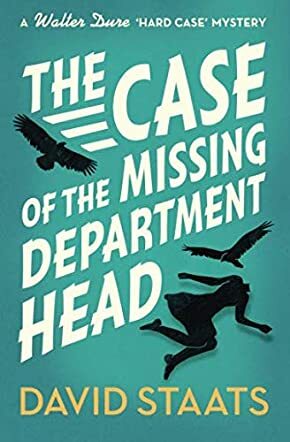 The Case of the Missing Department Head is a truly riveting read and I suspect the Walter Dure stories to follow will be too. In the thrilling page-turner, The Case of the Missing Department Head written by David Staats, a body is found attacked and disfigured by buzzards. Tiffany Houlihan is the head of the county library system in Canterbury, Essex where the story is set. Many fear her while others loathe her authoritative ways. When she is found dead in her own yard, her husband becomes an obvious suspect and so does her son. Still, attorney Walter Dure believes that his client is not guilty. But a surprise turn of events makes Dure’s job to prove the innocence of his client even harder. Worse still, there are no other obvious suspects. With nowhere else to deflect blame and with only days to go before the trial, Dure has to depend on instinct to identify Tiffany’s murderer. David Staats’ The Case of the Missing Department Head is a certain pot-boiler that combines the thrill of a murder case with accompanying legal intrigue. Houlihan is a problematic client. He is complacent and, when pressured, he forgets everything he has discussed with Dure. This makes the case more complex. The large number of suspects, the contradictory hints and the well-crafted opening scenes also made it impossible for me to guess the real murderer. Staats pays attention to every detail which helps in painting images in the reader’s mind yet keeps his descriptions succinct. The dialogue is crisp and engaging. Overall, The Case of the Missing Department Head makes for an engaging read and a wonderful addition to the Walter Dure “Hard Case” Mystery Series.